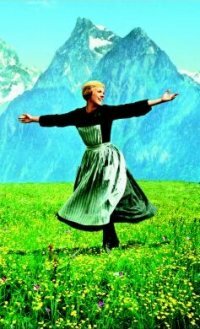 Unbelievably, not only had I reached the grand old age of 24 without seeing this film, I also had little idea as to the plot, with the only detail I could quote is that at some point Julie Andrews prances around the greenest fields in all the world. It turns out this happens almost immediately, and moments later I was asleep, for a good half an hour no less, so after several chapters were skipped back I tried again, but I stick to my guns when I say that this 3 hour musical about a singing nun looking after the seven children of a strict retired navy captain is really quite boring. Yes, the songs are catchy and have had a good run outside of the film – I know most of them and have never seen an episode of How Do You Solve a Problem like Maria? – but Andrews and the children are unbearably chirpy, Christopher Plummer’s Capt. Von Trapp too extreme in his before and after being Maria’d states and Charmian Carr as the terribly named eldest daughter Liesl is a long way from even passing for 16. Add to this the predictability of the plot, the inevitable mellowing of both the children to Maria and the stony Captain to everyone – through song of course – and the aforementioned nauseating level of happy everyone is, all you get at the end is a headache. Damn good nap though. 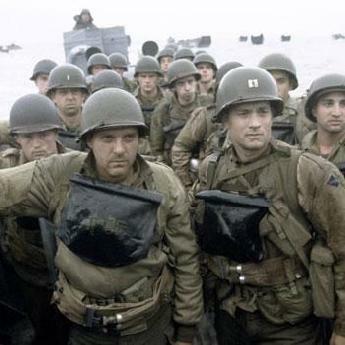 There is a drinking game, the most disrespectful and coma-inducing that I’ve ever come across, where when watching Saving Private Ryan the players all drink a shot every time someone on screen dies. 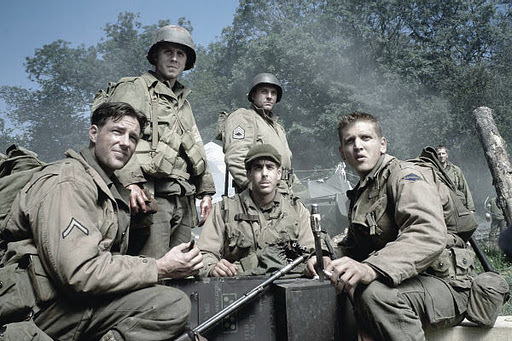 If one were to play this game, which I cannot advise for medical, moral and cinematic reasons, then I would recommend having 50-100 shots per player lined up ready and waiting for the opening 25 minutes of the film, as the much celebrated D-Day landing is a veritable cornucopia of fatalities, with soldiers coming a cropper as soon as the rear doors of the landing ships open, drowning in the water struggling with heavy packs, being carried to safety and every other way available. This opening scene is a landmark in war movie history, recreating the sense of utter confusion and imminent death present at that time. With a shaking camera, dialogue lost to explosions and gunfire, men wandering around after lost limbs and a bloody tide lapping at fallen soldiers and shot fish alike, it’s almost a relief once the landing has finished and they can get on with the plot, as Tom Hank’s captain is ordered to find Private James Francis Ryan, last survivor of four brothers and location unknown after parachuting somewhere in France. With a cast positively brimming with stars and up-and-comers – Giovanni Ribisi, Matt Damon, Nathan Fillion, Jeremy Davies, Tom Sizemore, Edward Burns, Adam Goldberg, Paul Giamatti, Vin Diesel, Barry Pepper, Ted Danson, Bryan Cranston, Dennis Farina – no character is left without some characterisation, or providing an insight into a soldiers life, be it collecting dirt from every country they fight in, writing a novel about their experiences or making sure every German soldier they come across knows they have been bested by a Jew. There are those that claim this is a long, boring film about walking, bookended by two of the greatest battle scenes in cinematic history, yet without the middle, where we truly understand the brotherly bond felt by soldiers fighting and dying together, would the closing battle – a much more personal, strategic affair than the opener, have such an impact? For my money this is Spielberg’s most cinematic film, showcasing his ability to show ordinary people in extraordinary situations, yet without losing the human touch. 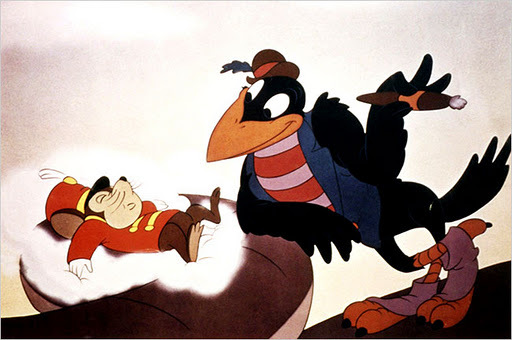 Alcohol is the solution to all life’s problems, as long as you can survive a psychedelic heffalump turbo nightmare that’s far trippier than you remember in this, Disney’s 4th feature length animation. Telling the story of Dumbo, an almost intolerable cute elephant born with ears so big they can be used as his own personal blanket, this follows him as he is ridiculed by the other elephants at the circus he’s born in, before being made a clown, befriending a mouse, getting hammered and meeting the most stereotypically racist crows ever drawn (“We’s all fixin’ to help ya’.”) Whilst much of Dumbo hasn’t aged well – the faceless black slavehands are another nod to Uncle Walt’s personal beliefs – and the plotting is far too fast for its own good, but the animation is vibrant and the characters beyond memorable. And if you can sit through Dumbo’s mother cradling her baby to sleep through the bars of the trailer she’s confined in without getting something stuck in your eye then you don’t have a soul. 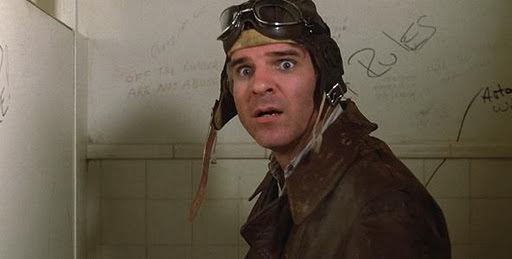 As soon as Steve Martin, in his first major movie role at the age of 34, tells us he was born a poor black child, you know you’re in for a bizarre ride, as Martin’s Navin R. Johnson, raised by a poor black family when abandoned on their doorstep as a baby, discovers he was adopted (“You mean I’m gonna stay this colour?”) and heads out into the world to find his future. Martin nails his naive, boyish role, capturing a childlike excitement at everything, and the tone retains an occasionally ludicrous but always hilarious feel, as Navin rises to greatness, then crashes down again. This was the perfect vehicle to shoot Martin into superstardom, showcasing his excellent comic timing, random sense of humour and skill with a pratfall. When a stoic gang leader in the slums of Johannesburg shoots a wealthy woman and steals her car, he finds himself unable to abandon the baby he finds in the back seat. Leaving the baby is unthinkable, yet returning it guarantees capture, and so begins the young hoodlum’s journey towards redemption, learning to mend his ways, asking for help instead of demanding it through threats of violence. The characters – particularly those of his gang members – are broadly drawn stereotypes – the smart one, the angry one, the fat one – but the acting is admirable from a non-professional cast, and there is little fresh ground uncovered as the standard comic misadventures occur when a man unprepared for parenthood finds himself in charge of a child; constructing a nappy from newspapers, dancing around to stop the baby from crying. The ending too seems botched, it would have been better for Tsotsi to have constructed his own destiny but this is certainly a great deal better than director Gavin Hood’s subsequent endeavour, the universally despised X-Men Origins: Wolverine. Has there ever been a character so seemingly written for a specific actor than Randy ‘the Ram’ Johnson, so perfect a fit for Mickey Rourke it’s impossible to imagine anyone else play him. Both were big in the 80s, Rourke at the peak of his game in Diner, 9 ½ Weeks and Barfly, Randy a top billing wrestler, but then saw their popularity wane and the roles dry up, before a comeback arrived, in the shape of Sin City for Rourke, as heavily scarred behemoth with a heart of goldie Marv, and a reunion battle with former nemesis the Ayatollah for the Ram. 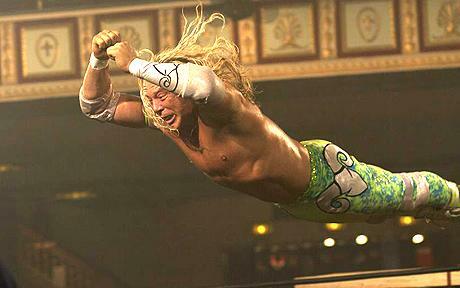 Rourke’s face, a battleground of botched plastic surgery and his four year stint of boxing in the early 90s looks like it’s been pummelled in the ring for years, and he nails every note of Ram’s trajectory, as a particularly brutal weapons match – in which a disabled spectator offers Randy his prosthetic leg to use as a club – causes the Ram to suffer a heart attack, and his wrestling days are over. Whilst struggling to adapt to a life without his one true love, he attempts to form a relationship with similarly aging, but still smoking at 45, stripper Cassidy (Oscar-winning Marisa Tomei) and reconnect with his estranged daughter Stephanie (Evan Rachel Wood). The flinch levels are unexpectedly high for a character piece, with incidents involving a deli-counter meat slicer and a staple gun proving the most worthy of a glance away from the screen. 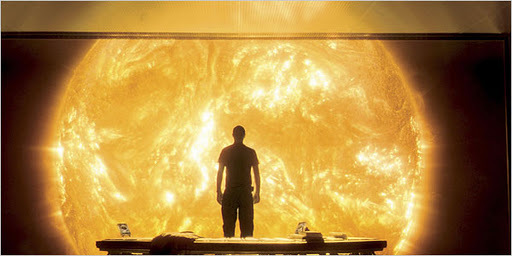 Director Darren Aronofsky – more known for deeper, more obscure work like Pi, the Fountain and more recently Black Swan, employs great cinematography, shooting everything on location with no sets and as many long tracking shots as he can, but this is Rourke’s game through and through, and though he wasn’t robbed of the Oscar (Sean Penn’s Milk was more deserving , in my opinion), I hope he doesn’t throw everything away with support roles in entertaining but cringeworthy fare like the Expendables and Immortals. He needs some more layered, meaty roles, I’m just not sure anything will ever be such a good fit.